Parts of WA registerd their highest temperatures in close to two years on Friday, while Perth sweated through its warmest day in eight months. A low pressure system centred to the north of Perth directed warm inland air towards the city on Friday. This was part of a large mass of hot air that also affected other areas of the state's west and north. 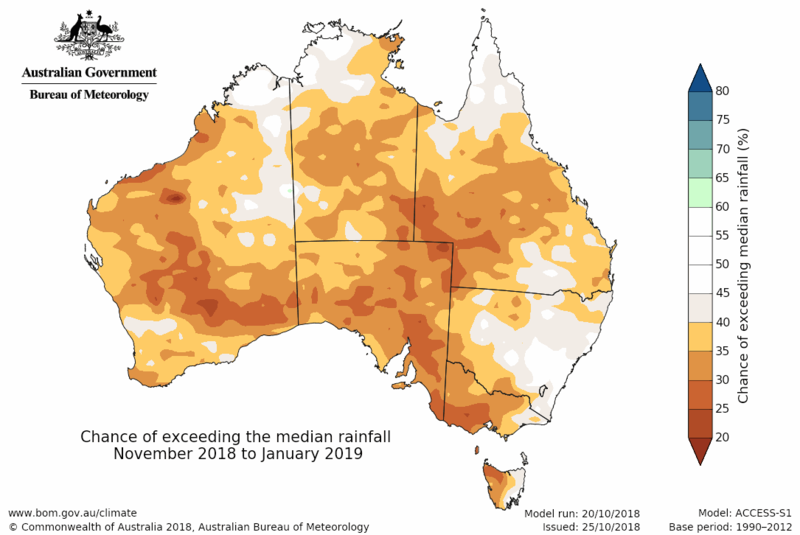 A dry and hot summer is anticipated for much, but not all of Australia, according to the latest seasonal outlook issued by the Bureau of Meteorology on Thursday. The first tropical cyclone to be named in Australian waters during the 2018/19 season will be Owen, followed by Penny, Riley and Savannah. A shift in the jet stream is responsible for a period of severe weather affecting multiple states and territories in Australia this week and some parts of New Zealand. A few things to focus on today and we’ll start over in Aussie with the Melbourne Cup this afternoon and the forecast looks interesting with the chance of late downpours even thunder around race time. Snow is likely to fall in Australia's alps during the second half of next week, a matter of days after the unofficial end of the Australian 2018 snow season. For the first time in four and a half months, the natural snow depth at Spencers Creek in NSW hit zero centimetres on Wednesday, October 31st. A late-season chill has recently hit Tasmania with frosts but the island state is about to gradually warm up during the next several days and nights. Temperatures have dropped to as much as 10 degrees below average but by the end of the week should be as much as five degrees above average. The Bureau of Meteorology's latest three-month outlook was released on Thursday and the message for most of Australia is clear: the odds favour warm and dry weather between November and January. It's been a month of see-sawing temperatures for some this October, and the last few days are no different for Adelaide and Melbourne. After a very chilly day for Adelaide on Wednesday, temperatures warmed considerably into the end of the week, climbing from around 6 degrees below average, to nearly 6 degrees above average.